Warren Buffett says his companies ability to generate large profits is the result of being able to focus on what is important, and not paying attention to things that would distract the company. Learn from the lens that focuses sun's rays to produce fire. → To win, you must have a strong focus. You can have anything you want but you cannot have everything you want. Focus is everything. Only do things you are best at doing. Stay focused on your vision and stretch goals. Focused action creates winners. Losers may be well skilled and go forward with determination to succeed, but they never reach their full potential, no matter how hard they work. Winners win and losers lose. 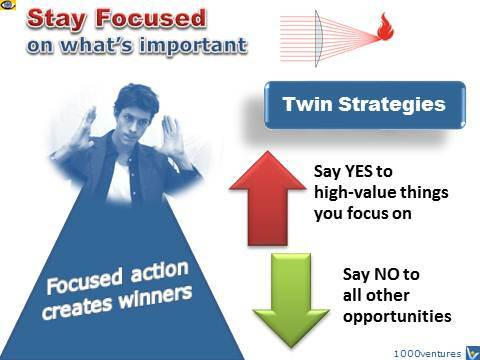 What makes the difference is high-level focus. Winners practice being mentally focused at a high level and have a more focused approach to continuous learning. Unleash "a winner" hiding inside you. You have limited resources and must use them in the most effective way. What is the best focus you can have? Don't get distracted in your goal pursuits. Pick 2-3 goals that are most important to you and your life vision, and stick to them. Most attractions are just distractions. You do yourself and your vision a disfavor when you say yes to less important opportunities that make you put your great goals aside. Use the 80/20 Principle to select the most important things, and learn how to say no to many small things if you wish to make your big dream a reality. Huge goals can be discouraging and cause procrastination. Break a big goal into smaller goals. Concentrate on achieving the smaller goals in the short-run, celebrate success, and start moving towards the next milestone.